It’s beginning to look a lot like Christmas! The season of fun, lots of celebrations and lots of food with cake being very much at the centre of proceedings. 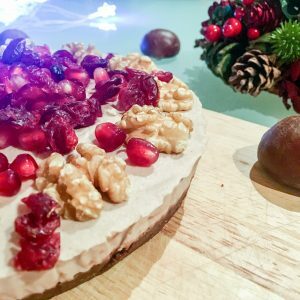 Christmas food is often rich and calorie dense but with so many options available, we are able to stay healthy and keep our lean bods throughout the festive season, while not missing out on all of the fun. 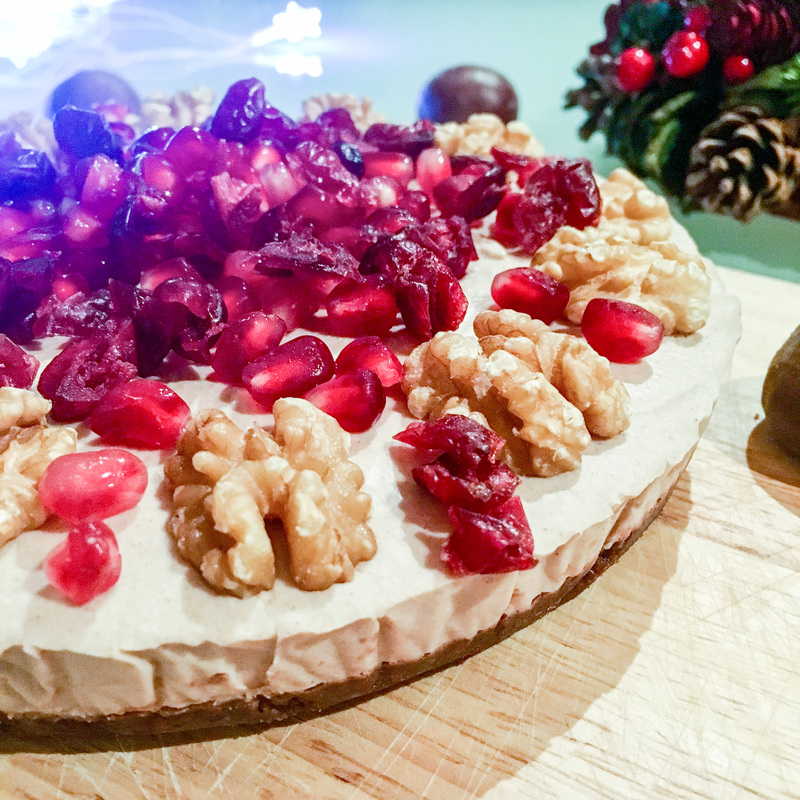 When cooking your Christmas Lunch, why not try a lighter option for dessert. After such a huge meal it’s actually quite nice to have something sweet, but less heavy, so we don’t end up with that post lunch carb coma and could maybe even manage a winter stroll with our loved ones-maybe! 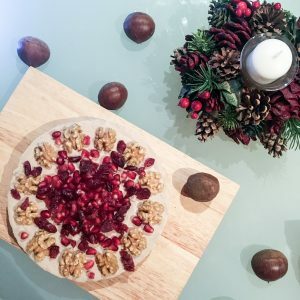 Here is my new recipe to help you make healthier choices at this beautiful time of the year. It’s my interpretation of the traditional Christmas Cake. It’s a vegan cake that is refined sugar, gluten and dairy free! It’s sweet enough to satisfy your dessert cravings, whilst so light and nutritious that you’re actually going to feel good after finishing it, I promise you. 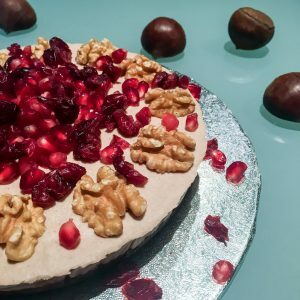 I used chestnut, walnut and cranberries as the main ingredients as, let’s be honest, they’re basically the taste of Christmas. They are not only adding a festive touch to the cake, but a lot of nutrients too which is always what we’re aiming for. Chestnuts may seem like an average, everyday nut, but there they have a number of important health benefits including their ability to improve digestive health, strengthen bones, manage diabetes, protect cardiovascular health, boost the immune system, and lower blood pressure. Chestnuts also increase cognition and prevent chronic illnesses. They are high in fibre and a great source of vitamin C.
Dried cranberries contain several beneficial nutrients including high levels of fibre, calcium, vitamin C and essential antioxidants. Many believe these nutrients in dried cranberries help to fight bacterial infections, lower cholesterol, and reduce the development of cancers in the body. Check the label of your cranberries as some have added sugar which we don’t need. Walnuts are high in protein, vitamins, omega 3 fatty acids, trace minerals, lecithin and oils. They contain a large amount of vitamins B6 providing 8 percent of the daily requirement. They also have plenty of folate and thiamin and a useful quantity of vitamin E in the form of tocopherol. A rich source of manganese, magnesium and iron, walnuts have potential health benefits in the area of memory and cognitive function as well. Low omega 3 intake has been linked to depression and decline in cognitive function. Taking into consideration that walnut is a rich source of ALA (omega 3), it no doubt promotes brain health. For the base layer place all your nuts in a food processor and process into a course flour. Next add Truvia, cocoa powder and salt and pulse a few times, until all combined. Then add dried cranberries and blend until the mixture becomes sticky. Finally add coconut oil and process a little bit more. The mixture should stick together when you squeeze a bit between your fingers. If it’s too dry add a bit more coconut oil. Line a 20 cm cake tin with parchment paper and transfer the crust. Press it down with your fingers. You can use a glass or a spoon to compact it as much as you can. Place it in the freezer while you make the top layer. For the top layer, put all ingredients except the coconut oil into your food processor or high speed blender. As the mixture is quite thick, you will need a blender with a tamper to move it around. Otherwise I suggest using a strong food processor to make sure you get a smooth mix. When the batter is very smooth add the coconut oil while processing. When everything is completely combined, pour it on top of your crust. Spread it as evenly as you can. Leave it to set in the fridge overnight. If you don’t have that much time, it sets in the freezer in a few hours too. When set, remove from the tin, and carefully peel off the parchment paper. Now all you left to do, is to get creative to decorate your cake! 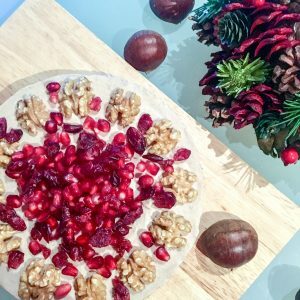 I used walnut halves, dried cranberries and some fresh pomegranate to give it that festive, jewelled look, plus adding in extra nutrients and freshness to the final creation.